What these three completely unrelated topics – quantum entanglement, continental drift, and ulcers as an infectious disease – have in common are two striking features: (1) they sounded completely nuts at the time; and (2) they are demonstrably and undeniably true. It is within this intellectual milieu that we approach the concept known as hormesis – i.e., that tiny doses of a particular chemical can cause a greater biological response than small or moderate doses. Sound ridiculous? Sure does. But, crazier things have happened. Under the hormetic model, low doses of a chemical cause a greater response than high doses. In fact, large doses inhibit a biological response altogether. Though hormesis sounds like something a homeopath would invent, there is actually plenty of evidence that this effect exists. Perhaps the most infamous involves so-called endocrine disruptors, chemicals that interfere with the effect of hormones in the body. Bisphenol A (BPA), one such chemical that has (rather implausibly) been linked to everything from obesity to male infertility, is thought to act through a hormetic mechanism. Setting aside the specific debate over BPA, a much larger mystery lurks behind hormesis: How exactly does such a bizarre phenomenon work at the molecular level? A paper in Critical Reviews in Toxicology by Edward Calabrese at the University of Massachusetts tries to answer this perplexing question by examining data on more than 100 agents. (1) A single cellular receptor, which interacts with the chemical agent, is responsible for both stimulating and inhibiting the biological response when the chemical is at a low dose and a high dose, respectively. Corticosterone and estradiol, both hormones, have been shown to act via this mechanism. (2) One cellular receptor responds to low doses of an agent by stimulating a biological response, while a different cellular receptor responds to high doses of an agent by inhibiting a biological response. Histamine, an inflammatory mediator, has been shown to act via this mechanism. 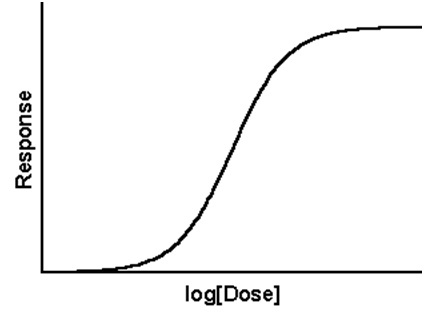 (3) A cellular receptor stimulates a low-dose response, but the cause of the high-dose inhibition is unknown. Nitric oxide exemplifies this mechanism. The fact that the hormetic effect has been widely observed – in different kinds of cells using different kinds of receptors – strongly suggests that the phenomenon is quite real. 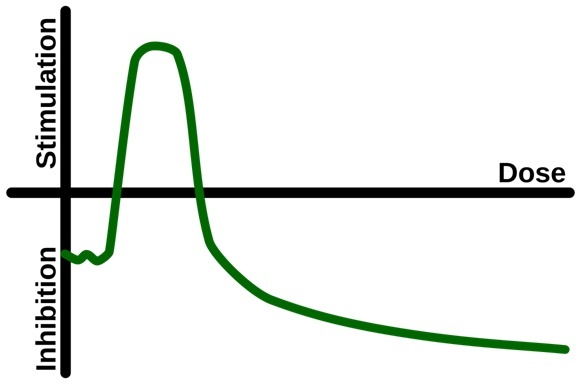 Detection of hormesis in whole organisms further underlines that this is not simply an artifact of in vitro research. Obviously, hormesis has wide biomedical implications. Dosing studies for medication must account for this effect. Furthermore, pollutants once thought to be harmless due to being present at a low concentration in the environment may not be as innocuous as we thought.